3 How Does Colistin Work? Colistin is a powerful antibiotic that is proven to be effective against bacteria, which are otherwise resistant to the effects of other antibiotics. Also called polymyxin E, colistin is a metabolite produced by soil bacteria called Paenibacillus polymyxa. Your doctor will prescribe the proper colistin dose that you need to treat any infectious disease caused by these Gram-negative bacteria. Colistin is a polymyxin antimicrobial drug that consists of a mixture of cyclic polypeptides. It is used to treat Gram-negative bacterial infections and is available commercially as Xylistin and Koolistin. It was limitedly used because of its toxic effects to the kidneys (nephrotoxicity). It therefore remains to be used as a last-resort antibiotic treatment for infections caused by bacteria that are resistant to multiple drugs, such as Pseudomonas, Klebsiella, Acinetobacter,and Enterobacteriaceae. of the digestive tract and as aerosol nebulizer for patients suffering from cystic fibrosis. Recently however, some centers have started using colistin intravenously to treat resistant infections, particularly those caused by Acinetobacter and Pseudomonas. Colistin binds to the fatty portions of the outer cell membranes of susceptible bacteria. In effect, it disrupts the cell membrane, causing leakage of the intracellular contents, which results in bacterial death. Colistin also binds and neutralizes substances in the circulation that cause pathophysiologic or toxic effects. Talk to your doctor before using this medication. Your doctor will determine if it is right for you and prescribe a suitable colistin dose for you. Colistin was first used clinically over 50 years ago, so it was never subjected to regulations like the newer drugs. There was no standardized colistin dose and not much research on its pharmacology. The optimal colistin dosage for most bacterial infections is still unknown. The usual dose of Colomycin IV is 1 to 2 M units taken three times a day for adult patients (60kg weight) with normal kidney function. The recommended Coly-Mycin dose is 2.5 to 5mg/kg a day (equivalent to 6-12mg/kg of colistimethate sodium/day). For patients weighing at least 60kg, colistin dose for Colomycin is at 240-480mg colistimethate sodium, while the recommended colistin dosing for Coly-Mycin is at 360-720mg colistimethate sodium. Furthermore, the maximum dose recommended for each preparation varies: 480mg Colomycin versus 720mg Coly-Mycin. Every country has varying generic preparations for colistin, and the corresponding colistin dose depends on the manufacturer. The complete lack of regulations of colistin dosage therefore makes intravenous dosing difficult for most physicians. Colistin has also been effectively used with rifampicin, another type of antibiotic, as well as other antipseudomonal antibiotics. Colistimethate sodium is also used to treat lung infections, particularly in cystic fibrosis. 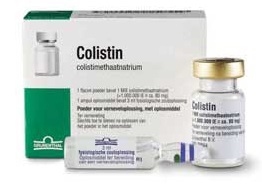 The recommended adult colistin dose is 1–2 M units (equivalent to 80–160mg) as nebulised colistimethate two times daily. Except for colistin dose, there are two forms of colistin you should know. These two distinct forms of colistin are available commercially. These are colistimethate sodium and colistin sulfate. Colistin sulfate, which is cationic, is stable, while colistimethate sodium, which is anionic, is easily hydrolyzed. The two drugs are eliminated from your body through different routes. They may not be used interchangeably. Colistimethate sodium is used to treat infections caused by Pseudomonas aeruginosa in patients with cystic fibrosis. It has also been recently used for treating resistant Acinetobacter infections, or meningitis or ventriculitis caused by P. aeruginosa. Colistin sulfate is used to treat infections in the intestines and to suppress overgrowth of colonic flora. It is also used as a topical cream, powder, and otic solution. Colistin A/polymyxin E1 and colistin B/polymyxin E2 can be studied individually to determine their effects as separate substances.